True story. HB 1073 failed to make it out of the transportation committee meeting today. After opposing testimony from a representative who helped with an amendment to make it more moderate, and opposing testimony from the Departments of Transportation, Public Safety & Tourism even the primary sponsor/chair of the committee voted to scrap the bill. Hear the audio from the meeting here - http://ow.ly/XE5yF - it's a bit lively. Among the highest of lights is the Secretary of Tourism saying interest in bicycle tourism is at an all time high and he echoed someone he heard say all bicyclists do is quietly roll through the state and leave behind a trail of money. FAB President Chris Parsley does an excellent job of teaching lane control in 4 minutes or less. People who hear will think they're listening to testimony but what he's really doing is teaching. Go ahead listen in, maybe learn something. There was one shaky resident of the Black Hills who opposed the bill. Boy I appreciate that. In that position I AM that. There was Rep Krischman making an awkward joke about being in the wrong room - it's not his committee - and then saying "it's been 8 beers since..." - he meant "years." The discussion about what a Class 2 Misdemeanor is was oh so disappointingly wrong and incorrect. Rep Bolin got way out of line when questioning Rep Deutsch. OUT OF ORDER! Rep Rasmussen did all but move her non-existant reflective clothing bill. It's coming! Be ready! Rep Schoenbeck got really disappointed with the DOT. Really disappointed with the state of rider/driver relations on the roadways. Then pretty much everybody agreed that something needs to be done, just this bill isn't that right something. DANGER! When legislators think something ought to be done. Tabled to the 41st day of the legislative session. Like you do in South Dakota, because if a bill is sitting on the table and nobody is around to take it off the table - is there really even a bill? Here's an article from the local Argus Leader about what transpired today. Yes, that's Chris Parsley and I in there. My friend Jessica and I were on the Dakota Rural Action "Voices" podcast after the vote today. The podcast hasn't been released yet. I can't wait to hear what I said. Jessica, of course has nothing to worry about because she's great. I do know that as my opposition to the idea of a reflective clothing bill was coming out of my mouth I was happy about the words - but maybe I wasn't listening closely enough. The podcast page is here. I'm hosting another Bicycling in the Legislature call next Tuesday. The Facebook event is here. The call information is on this blog post. The phone number and meeting IDs are the same, the date and time is 2/2 at 12:15pm. Resist HB 1073! Do It Today! Sometimes it's fun to try to come up with ways to look at something that maybe is different enough to get the representative to read to the end...for what it's worth, here's what I sent. Tomorrow you will be presented with HB1073 - the "get bicycles off the road" bill. I understand there are concerns in the western part of the state over tight windy roads and the safety of riding bicycles on them. As a bicycle rider and road safety advocate I address unsafe conditions through my local transportation authority. Usually that's my local traffic engineer but sometimes it's the State DOT. I think the State DOT is up to the challenge. I understand they thought better of allowing 80mph on I-90 through the hills last year after your body helped champion the 80mph speed limit bill. Their reasoned response was to keep limits the same in that area – because speed kills. Let's keep local control local - please do not pass HB 1073. We do not need this to be the standard across the state. The DOT has tools to address road safety yet still respect the interests of all road users and a road uses. We're already knee deep into the 2016 Legislative Session. HB 1073 is in the hopper and making the rounds across the nation - oh, Momentum Magazine ran a story - it's making the rounds across the continent. I haven't posted anything to the blog. I must be tired. By this time next year there could be a lot of people in reflective clothing, standing on the roadside with bikes, 15' flags in the air trying to remember a time when riding bikes in South Dakota was fun, safe and healthy. Because there's plenty of people engaged - and in the end far more will be typed on keyboards about this than done about this, I'm taking a different tack this year. Weekly connection, getting people from across the state on the phone, sharing information, giving encouragement, hopefully directing some action. Feel free to join in the fun. Meeting #1 is January 26 at 12:15 Central. 1. Please join my meeting, Jan 26, 2016 at 12:15 PM CST. 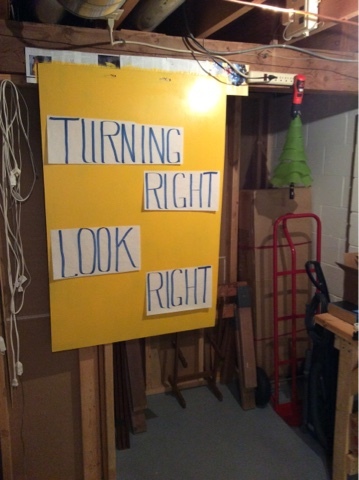 If a person (me) were to stand on a busy street corner wearing a sign that would bring attention to the need to look right when turning right, what should that sign say? Turning right? Look right too. You should look right too. Any suggestions? I'm looking for just the right thing and I still haven't found...it. If somebody will design for me a very nice sandwich board sign that asks "Why do you only look left when you turn right?" and loans me a funky costume, I'll get it in the news. Yesterday The Dad, standing on the corner waiting to walk his bike across the Minnesota Ave & I-229 intersection, was knocked over by a right turning left looking driver. Lesson 1: even knowing the hazards isn't full protection from drivers who don't look. Lesson 2: make the report on the scene. Failure to do this could result in very messy living room carpet. And MAKE THE REPORT because THEY need to know it happened. Lesson 3: if you get run over and you are related to or friendly with me you will be assigned to write a report. Today, at 4:20 PM, 6 miles into my bicycle ride I got to my intersection. The first car exiting the interstate looked left and turned right (across my intended path). 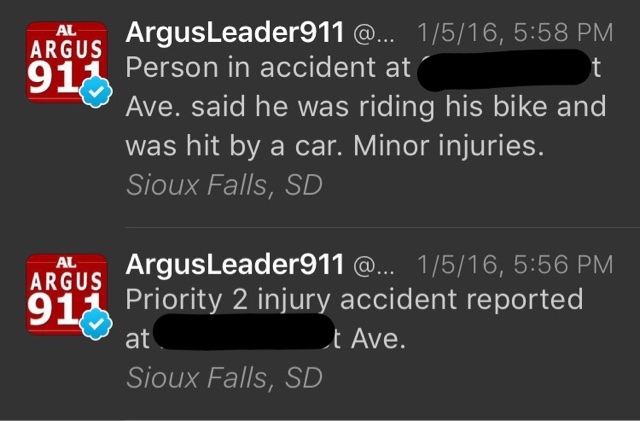 I stopped as required by Sioux Falls’ law, but this driver was intent. I got off my bicycle because pedestrians have more rights that a bicyclist. I stood there saying to the driver repeatedly, “It’s my turn; it’s my turn.” The driver made the turn, and it scared the bejesus out of her when she saw that I was there and she drove where she never looked. The rule is that the second driver learns from the first driver. Today that changed. I stood there saying repeatedly to the second car, “It’s my turn; it’s my turn.” The driver made the turn, and this time she turned sharply into the nearest lane. Seeing me scared the bejesus out of her, too! I couldn’t get my bicycle out of the way fast enough. She rolled over my front tire pushing the bike down and, domino like, pushed me down. I went flat on my back into the snow bank. I knew my left knee hurt, and it got a minor abrasion. Must have been the third car that witnessed the event. Her first words to the driver were “you ran over his tire pretty good.” I say, “Thank you, ma’am”, and I got her card. My bicycle is fine, the wheel is true. My new rule is that in all the planning and anticipation of dangers, include calling the police and making a report. The city needs to know that these things happen. If you’re still reading, don’t miss this advice. Go ahead and call the police right there. I made a late report. Fire and ambulance came with sirens and lights. They’ve got their protocols, you know. Ten of them filed into my house like there was an emergency! 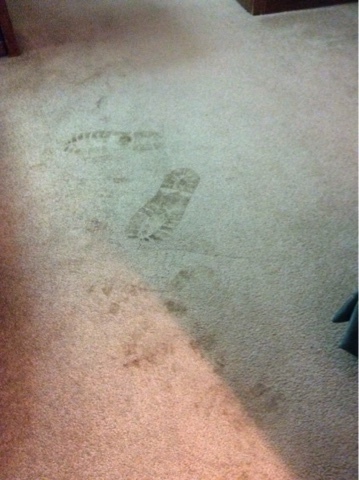 As I write this, Nora has not yet seen the carpet; not-to-fear, I know how to call 911. The police report is #16-1162. The next Saturday Coffee Shop Ride is January 30. It departs from the Minnesota Ave & 13th St Starbucks which is at the intersection of (can you believe it?) 13th St and Minnesota Ave. 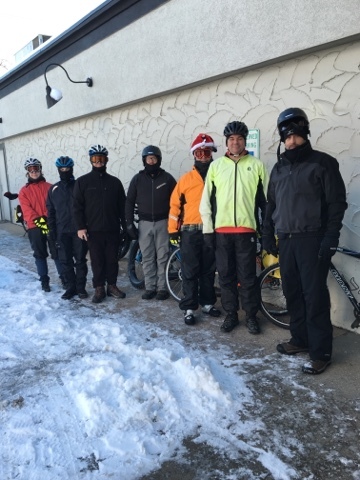 Here is December's hearty & hardy group. The ride leaves at 9am. The loop is 9.5 miles and is weather adjustable. 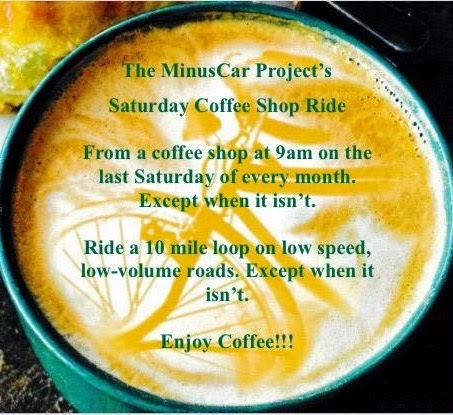 Here are general expectations of the Saturday Coffee Shop Rides. Faster riders may find the slowish speed of this ride mentally taxing.